4Lobe Events DC Metro is a boutique special event company focusing our products and services on the culinary and culture of the Washington DC area, including Maryland and Northern Virginia. We work with small and large groups to create creative, exciting alternatives to normal events and team building activities. We were developed as a sister company to DC Metro Food Tours to provide a solution to our clients increasing interest in events and team building activities that were not necessarily tour based. Our goal is to show you the range and depth of the food and drink scene in the Washington DC area through our events and team building activities. We are focused on creating value driven products with an emphasis on top notch customer service throughout the way. We run our events and team building activities in neighborhoods throughout the Washington DC area, including Capitol Hill, Georgetown, U Street, Old Town, Dupont Circle, Adams Morgan, Columbia Heights, Woodley Park, Arlington, Bethesda, and Loudoun county, just to name a few. By emphasizing the culture of the DC area through its food and drink, we are able to provide small and large groups with a lasting and unique experience on all of our events and team building activities. From themed, multi-station receptions to spousal events, to hands on cooking challenges, we work to combine the essence of iconic DC and surrounding areas into everything we offer. See below for our current culinary focused events as well as team building activities. Our goal is to ensure your group experiences a fully customized event, that meets your requirements and exceeds expectations. Over the past 10 years, we have developed and customized thousands of events, tours, and team building activities for both corporate and non corporate groups. We can utilize our back catalogue of events, and modify it according to any date, time, location, cost and other constraints that may be required. Otherwise, our award-winning event staff will create an event for your group. Incorporating food and drink into a traditional team building setting provides guests additional ways to work together, learn about each other and build camaraderie. Culinary team building can be used to combine a social activity, meal, drinks, and a team building activity together for companies or groups that have specific time, budget or other constraints. We ran our first culinary challenge eight years ago, which was a combination of work and preparation to create an exciting new product line. Today it is now our signature series of team building events with more than twenty variations. Our event planning staff is continuing to innovate and plan to offer even more for the coming year. The premise of the culinary challenge is for guests to work together in groups to create a specific dish, drink, meal, dessert, etc. within an allotted timeframe. Within groups, guests can have roles to help establish responsibilities, and create workflows to ensure team bonding and that job will be done. Our products utilize our mobile kitchen system and build upon it whenever needed. This enables us to offer our Culinary Challenges almost anywhere. Groups are up to 1000 per instructing team and emcee, although we have emcee teams, instructors, and coordinators per every group of 50-75 when we host larger events. Work as a team or individually in our 4Lobe Events Cooking Classes. We offer numerous courses taught by engaging, enthusiastic local chefs throughout the DC area. Featuring specially designed recipes, easy to follow instructions, hands on demonstrations, and variable difficulty levels, in order to offer something for everyone. We use our mobile kitchen system rather than rely on a single kitchen to make your cooking experience convenient. 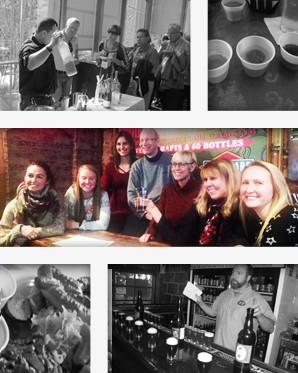 With the support of sister company DC Metro Food Tours, we offer tour oriented events and team building activities. We reimagined the traditional scavenger hunt to incorporate the search for food and drink alongside other cultural elements to create the culinary scavenger hunt. We offer the scavenger hunt through some of the DC areas most iconic, historic, and exciting neighborhoods. Highly trained scavenger hunt guides teach guests about the area, explains the rules, and are available to answer questions, provide hints and other support throughout the way. Groups receive a custom scavenger hunt package featuring puzzles, and questions. Teams need to seek out, photograph and complete the questionnaires within a time frame. The team with the most points wins and receives a prize package. Choose from Capitol Hill, Georgetown, Old Town, U Street, Dupont Circle, Adams Morgan, Shaw, Bethesda, Clarendon, Penn Quarter, Midtown, the Wharf, Union Market, H Street and more. We can help you figure out the right area for your group if you do not know. Our events and team building activities are popular for corporate groups but is not limited to it. We have options to customize our events and tours for non corporate groups such as wedding parties, family reunions, or simply groups of friends. Over three hours, enjoy a fully guided tour that combines history, architecture, culture and local food and drink. During the food tour, you will stop at 4 acclaimed restaurants for specially created dishes. Visit one of the 14 DC area neighborhoods in which we offer food tours. Groups visit three restaurants and enjoy an appetizer, main course, then a dessert at each different restaurant. A progressive dinner can take place either by foot within one neighborhood, or by motorcoach, limo, or bus, and visit restaurants within several neighborhoods or the city. A dine around is a more formal and customizable version of a food tour. Dine Arounds typically visit three restaurants rather than four or five, spending more time at each place. Guests enjoy multiple dishes at each restaurant, have the option of beer wine or other alcohol pairings with dishes as well. Dine Arounds can be modified to fit the needs of most groups, and are a great option for larger groups. Restaurants can be chosen to fit a theme, or based on the interests of the group. The single restaurant Dine Around is a good option for large corporate groups, conventions, and other occasions where the varied dining needs of the group must be met. We put together pre-selected multiple course meals at different Washington DC area establishments. Guests can choose between several select entrees and appetizers at the location. Guides will provide a tour if desired on the ride to the restaurants. Working in cooperation with our sister company Welcome DC Destination Management we can offer full service destination management support, including logistics, meals, event planning, accommodation, transportation and more for larger groups that may be interested in holding a convention, annual meeting, or retreat in the Washington DC area. We can work alongside or even provide options for additional event planners or specialists depending on your need. Since much of what we do is within the world of the FTC4Lobe Group, your group will not be paying the same passthrough costs that can be attributed to other Destination Management companies. As a culinary and cultural focused Destination Management firm, Welcome DMC works to bring the destination into the spotlight, and emphasise the culture, food and drink whether you are in Washington DC, Alexandria, Arlington, Loudoun, Bethesda, Silver Spring, or Loudoun County. The interactive dining event brings the intriguing enjoyment of several DC neighborhood food tours into one venue. Images, music, and other thematic elements are incorporated in areas throughout the reception. Tour guides are interspersed throughout the venue to help bring you from place to place, and a lead emcee oversees the entire event. Washington DC area chefs and mixologists are brought in to help discuss, demonstrate, and prepare dishes and drinks. The ultimate goal is to bring the DC area to you and combine our expertise in Food Tours and culinary events into one place. The capitol of the United States and home of the branches of government, Washington DC, is a hotbed of culture, cosmopolitan activities, historic neighborhoods, and great food and drink. The District, and close by cities in Northern Virginia and Maryland offer ethnic enclaves, historic and significant neighborhoods, world class museums, fantastic nightlife, and phenomenal architecture. The region also boasts a collection of memorials second to none. The Washingtonian is a constantly evolving generation; they demand a high living standard, which has introduced an increasingly high standard in local restaurants and bars. Formerly derelict neighborhoods have been revitalized to their former glory and beyond. Neighboring Alexandria includes historic, charming Old Town, home of George Washington and Robert E Lee, as well as Arlington Cemetery, Fairfax, Korea town and Little Vietnam. The city has an unparalleled collection of free, public museums and the lion's share of the nation's most treasured monuments and memorials. The vistas on the National Mall between the Capitol, Washington Monument, White House, and Lincoln Memorial are famous throughout the world as icons of the world's wealthiest and most powerful nation. We offer events and tours throughout the DC Metro area, including Northern Virginia, Arlington, Bethesda, Fairfax and more. Our staff offers an array of culinary team building throughout the Washington DC, Maryland, and Virginia area. Groups can explore the colonial era Georgetown, Old Town Alexandria, and Leesburg, or the hip and bustling scene in neighborhoods such as Logan Circle, 14th Street, U Street and Shaw, or the iconic culinary marketplaces such as the Southwest wharf featuring the historic fish market and brand new market, Eastern Market, and Union Market. The DC area continues to grow as a wide range of individuals, from young professionals, to growing families, to empty nesters choose the convenience, amenities, and excitement that the Washington DC area has to offer.